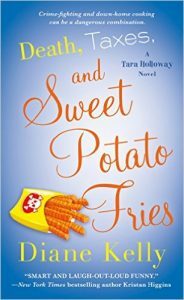 Diane Kelly » Sneak Peek at Death, Taxes, and Sweet Potato Fries! Sneak Peek at Death, Taxes, and Sweet Potato Fries! so I especially appreciate your realistic view of the laws. Please try to continue your series, will be so sad to get to the end!!! So glad you’ve enjoyed the series, Noe! I’ve had so much fun writing these books, too! I bet your husband has some interesting stories, huh?